Romeo and Juliet with Gundams. I think it could be easily argued that this is one of the best Gundam shows ever made but that would be doing it a disservice because it's a great show in general. On one side we have Shiro Amada fighting for the Earth Federation. 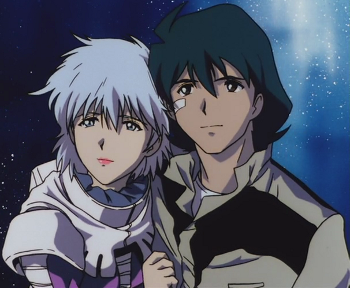 He's being deployed to Earth as a commander for the 8th Mobile Suit team (hence the title of the series). On the other side we have Aina Sahalin fighting for the Principality of Zeon. She's being deployed to Earth as the pilot who will test the powerful prototype mobile suits the Zeon are developing. Both will face the hardships of what their sides of the war demand of them on top of finding their place in a war torn universe. - It doesn’t stick to the Gundam formula. I'm not going to dive too much into this. I think we can all agree that more than enough Gundam series are literally the same story of the original Gundam retold for a new era with possibly a new gimmick to make it feel fresh other than the new paint job. 08th MS Team tells its own story instead of recreating the experience of the original Gundam yet again. Unlike most Gundam shows, there isn’t one side cast as the villains. There are “heroes” and “villains” on both sides of the war. Everyone has their motivations for what they do including those who are sick of the fighting which is at the core of the story. As I mentioned before, this is closer to a Romeo and Juliet story. The two main characters will have to fight all odds to try and be together amidst the chaos of war and the fact that they’re fighting for different sides brings up the issue of where their loyalties lie. - It isn’t the typical Gundam series. This could scare others away but I’m hoping it doesn’t. Even though this was an OVA series, it was made some time ago and it shows. Overall I think it still fits the series rather nicely but it may be a turn off to some. This is Kylak signing out and being deployed to Earth to finish more posts.